Over the last decade there have been precious few bands who have written as many of my favorite tracks as The Hold Steady. They're back again with the highly-anticipated new album Teeth Dreams (I have no f-ing clue what that's supposed to mean). The new set of songs are, not surprisingly, heavy on the guitar rock. Tracks like "I Hope This Whole Thing Didn't Frighten You" and "On With the Business" are hard driving from their opening notes. An element of pop sensibility has been lacking from the band since the departure of Franz Nicolay. They seem to have regained some of that this time around. The keyboards return, bringing with it a renewed sense of melody on "The Only Thing". The hook on "Big Cig" may be the sharpest one since the Stay Positive album. The spot of the slower, more introspective songs are filled by the softly-strummed "Almost Everything", and the measured "The Ambassador". The latter is the album's most emotionally-charged and moving entry. 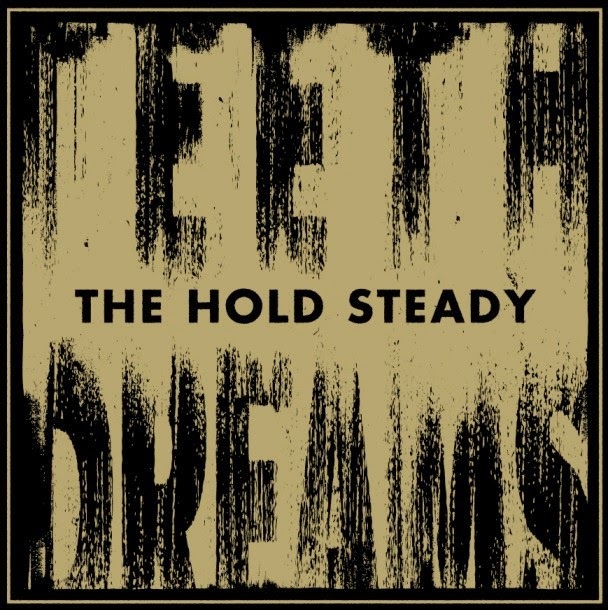 Traditionally, The Hold Steady have capped off their records with a sprawling dramatic epic track. This time it's "Oaks", a song that just doesn't connect in the way we've grown accustomed. Teeth Dreams doesn't have as many instantly memorable tunes as say, Boys and Girls In America, but that's a nearly impossible standard to hit. It does, however, take some strides back in the right direction. The Hold Steady play The Phoenix in Toronto on April 9th. Best tracks: "Big Cig", "The Ambassador"